Ah, geeks. They're always trying to out-do each other by proposing in silly ways, filming said marriage proposals, and then posting them on YouTube in hopes of getting Internet-famous. This is perhaps the geekiest marriage proposal yet. This dude didn't just propose like a normal geek--with Internet memes, or to a video game character--no, he went all out. 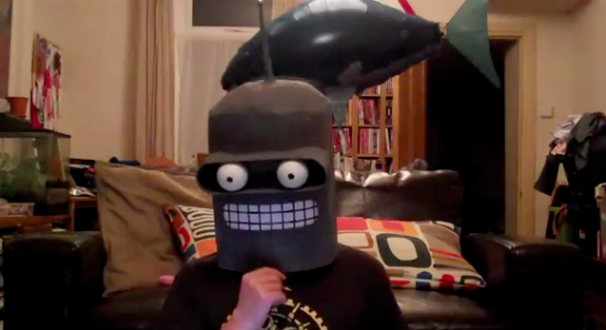 YouTube user doctorpappa made a video of himself wearing a Futurama Bender mask (for those of you in the dark, Bender is an animated robot) and speaking in binary. Er…yes. Speaking in binary. He rattles off a series of 0's and 1's over the course of three minutes and presumably expects his true love to decipher the code. And she did, of course--but it took her about a half hour to do so. "My boyfriend told me I had to close my laptop for a couple minutes, then when I logged back on this was posted to my facebook wall." The lovely geeky lady to whom doctorpappa was proposing told Geekologie. "He sat across the room as I transcribed and then decoded it. After about a half hour I found out it says, 'Rachel, you are awesome. Will you marry me?' I said yes, of course :B"
To make it even geekier, as Gizmodo points out, there's a flying remote-controlled shark balloon in the background. Geekiness is all over this house. So congrats to the happy geek couple, or should we say, "01000011 01101111 01101110 01100111 01110010 01100001 01110100 01110011 00100001."